1. These are our twin (almost 5 year old) grandsons. Logan, on the left, is the one who had a part in catching this bad boy northern. 2. 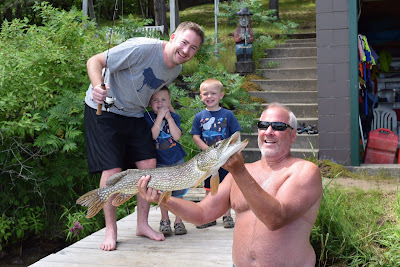 Logan and his brother, Jackson, were fishing with their dad and grandpa from our family's cabin dock. 3. A sunfish was the bait that this northern hit on! Logan was fishing on the dock with this ugly stick; a great pole for young kids! He caught a sunfish on a jig. 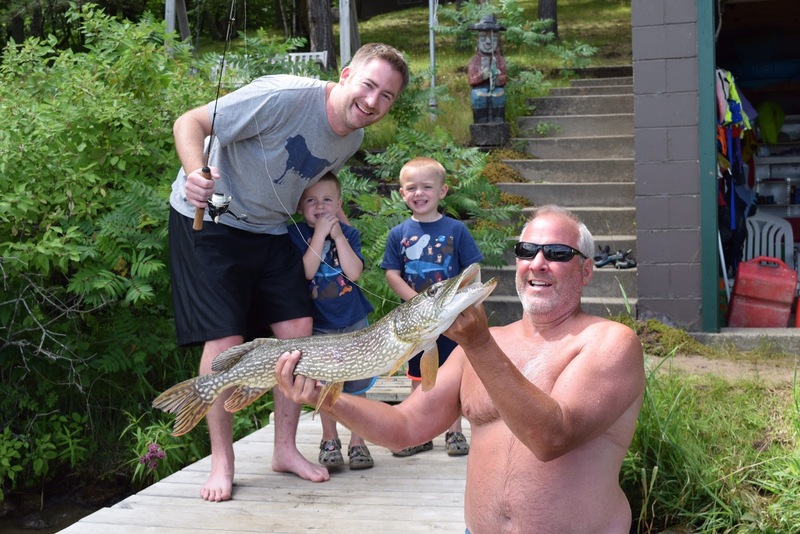 Grandpa Jeff was helping him reel in his sunny, when this big northern came up and ate the sunny! After 5 minutes of jumping in the water and getting the northern loose from a stump Logan and Grandpa Jeff had their catch! 4. This is Great Grandma's cabin property on the southwest side of Long by Hubbard! 5. It was July 8, 2016, around 2 pm.